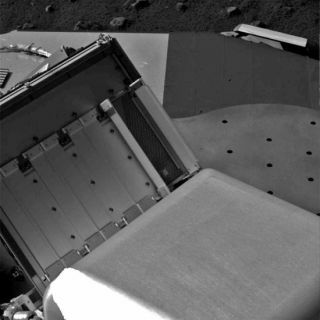 A scoop of icy soil was collected by NASA's Phoenix Mars Lander's robotic arm but is stuck on the scoop and could not be delivered to the robot's onboard oven. Once the sample had been collected, the robotic arm tilted its scoop and ran the rasp motor several times in an attempt to sprinkle the sample into the oven. The final step was inverting the scoop directly over the wide-open doors. A screened opening over the oven measures about 4 inches (10 centimeters) by 1.5 inches (3 centimeters).